One of our teammates has gone to participate in the greatest tournament of all. The Ishpeming Ski Club is here to say good-bye and to honor one of its friends and comrades. A special relationship develops with ski jumpers – relationships of special character bound together with living through fear, hours of hard work, and sharing in each other’s accomplishments and disappointments. I could speak of Troy’s accomplishments – I know that he has a drawer full of ribbons and medals, and a scrapbook of newspaper articles with pictures and tournament results, but today Troy has attained his greatest accomplishment. In 1998 Troy succeeded in attaining one of the goals he set for himself when he was a very young skier – to qualify for the Central Division Ski Team, and compete in the U.S. National Junior Olympics. Troy’s skiing accomplishments speak for themselves. Troy represented the Ishpeming Ski Club with a profound sense of pride and leadership qualities. His name was familiar throughout the division and at the USSA Office in Park City, Utah, as can be seen by flower arrangements and contributions sent to him from other clubs. Troy was more than medals and ribbons. Troy’s contribution to the ski club, and in particular, the Junior Jumping Program, was that he was a caring, giving, and unselfish young man. He had a strong love and commitment to his family. His family came first and skiing came later. A junior jumper in Ishpeming was his goal. He may have many other goals like competing in the winter World Olympics some day, but an Ishpeming ski jumper’s first goal is to jump Suicide. I remember a time when Troy’s father was severely ill and receiving treatment for his illness. Troy’s goal to jump Suicide was not as much a goal for himself as it was a goal to make his father proud of him. Troy, I believe sensed an urgency in jumping Suicide two years ago. I remember talking to Troy convincing him not to do this as he was not ready yet and his mother didn’t need another one of her loved ones in the hospital. Troy wanted this, and prayed, he prayed for his father, and one year later, with his father standing at the bottom of suicide, watched his son take his first jump off Suicide in March of 1998. Troy and his father embraced and the goal was obtained. Troy was a giver. He was particularly interested in youth and their development. I remember another incident that happened last winter. Every year we usually get a number of new skiers. The older jumpers, one of which was Troy, tried to get in as many jumps as possible to prepare for the qualifying competition for Junior Olympics. Every jump is crucial and most skiers wouldn’t give up any of their time if it meant taking jumps away from themselves. During this particular training session, a number of the old junior jumpers were preparing themselves for training on one of the larger hills. Troy felt moved by a need to help the new jumpers and stayed back, walked over to the kids, and began teaching the in-run position to the 4 or 5 new kids who didn’t know what they were supposed to do. This was not a one time event. Troy did this on several occasions. This and many other actions are a true testimony to Troy’s unselfish nature. Troy’s goal was to compete in the 2002 Winter Olympics. He said “I pray for it every night”. We will never know if that dream would have been fulfilled. I do know, however, that Troy had as much a chance of going to the Olympics as any other member of the Ishpeming Junior Ski Jumping Team, and I also know if any of our kids do go to the 2002 Winter Olympics to compete, he will be carrying Troy’s dream in his heart, and it will be in part due to Troy’s influence, whether that be by their knowing him in life, or spiritual guidance after his death. His teammates and he are training together as they have done countless times before. They are preparing for the upcoming season. The coach has planned for summer, and has high hopes for all these young skiers. As they train, a mysterious thing happens, a van appears, quite out of place, and stops as if to be waiting. No one notices, no one but Troy. He looks at his fellow ski jumpers and then at the van. He doesn’t understand why they don’t see. He walks toward the van, the door opens. No entry fee needed – it has been paid. He turns his head to look at his teammates. They still are unaware of his absence and see nothing of this mystery. He watches his friends through the window as the van moves away. No wax box needed, no jumpsuit necessary, for where he is going conditions are perfect – skis will be provided. He sits on the bar start, the highest one, the one closest to heaven – alone- for he is the only one invited to this tournament. A soothing breeze sweeps past his face. He turns to make one last check of his binders and notices he is no longer alone. A figure sits beside him. This image of a man, who does not look of this time, for he is dressed in a wool V-neck sweater, he has a shirt and tie under the sweater, atop his head he wears a brimmed hat made of wool and leather croppers for mittens. 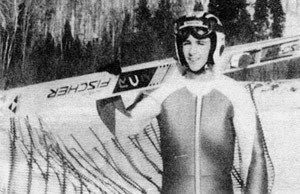 His skis are not Rossignol or Elan – they are worn and made of solid wood. His ski boots are old and square in the toe. This man was from a tournament of long ago. This man extends his hand and touches the young skier’s shoulder and says, “Hello Troy – my name is Paul – Paul Bietila. Wait for me at the bottom of the hill and we’ll walk home together”. One of our teammates has fallen. We run to him as he has run to each of us. We cannot find him. We will continue to search for him, and in our own time, in our own way, we will find him — waiting — in our hearts. On June 3, 1998, the Ishpeming Ski Club lost a treasured friend and talented ski jumper when Troy was involved in an automobile accident. Troy skied with us for several years and was a frequent winner in the competitions throughout the Midwest. In 1997, Troy qualified for the Junior Olympics, National Championships, an honor accorded to the top junior ski jumpers in the United States. Troy was planning to spend the summer in Europe with his coach Martin Bayer when he was taken from us. Troy’s enthusiasm for ski jumping, his sense of humor and his team spirit will be greatly missed, but his memory lives on in our hearts. The angel pins his teammates wear on their helmets are a reminder that Troy is flying with them as they participate in the sport he loved. The Junior Ski Club had dedicated this year to Troy and our annual Junior Tournament will here after be called the Troy Gravedoni Memorial Tournament. A traveling trophy, in his name will be presented annually to the top team in the tournament.